Our motto is simple; "make it more fun". We do this by delivering our specifically designed program for each age group with energy, enthusiasm and excitement. This creates an atmosphere in the class that is totally unique and engaging for parents and children alike. 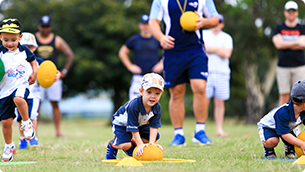 "Rugbytots is a great way to introduce children to rugby union and league. I would recommend it to anyone looking to get their child involved in a structured activity with a focus on fun." Our youngest classes require full parent participation and offer a fantastic opportunity to spend quality time with your child whilst they learn new skills, meet new friends and have an exciting introduction to Rugby. Its fast-paced fun and your child will learn about shapes, colours, numbers and counting, they will be encouraged to work independently as well as enjoying team games. 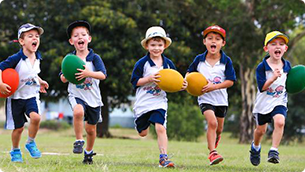 Rugby specific skills are gently introduced and all the equipment used in these classes has been specifically designed and selected for toddlers. 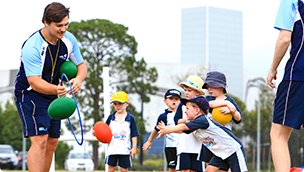 We use sponge foam balls so the children can catch, pass and kick their goals with confidence. Its colourful, it's lively and it's guaranteed to brighten up your day. These classes do not require full parent participation, however, cheering and encouragement is essential! Your Rugbytot will be part of a dynamic session that will develop their social and physical skills in a positive environment. With slightly more focus on Rugby specific skills, your Rugbytot will discover a new world of sporting imagination. Finding space, looking after the ball, scoring try's, running with the ball in two hands and general agility and balance are just some of the things your child will learn during their time with us. In this class we use colourful size 2 rugby balls that are specially designed for small hands and feet. Our older age group classes really start to prepare children for life after Rugbytots. The same structure is followed but these sessions involve advanced team games and we ensure that the basic skills of rugby are coached in the right way by maintaining small class numbers. The Program for this age range focuses on fun and encouragement whilst enhancing self-esteem and confidence. The rules of tag rugby will be gently introduced and every session will include a game of tag rugby preparing your child perfectly for their next adventure.